Get the facts about tonsils and adenoids in simple terms. Reduce your own anxiety about surgery and recovery. Learn how to best support your child through the medical and emotional events surrounding the procedure. Have scripts available to guide your conversations with all of your children. Discover the sequence of events leading up to surgery and how to prepare for them. Find out what you need to have at home while your child recuperates. Understand and respond to any unforeseen complications. Become confident that you have maximized your child’s comfort and adjustment during the weeks surrounding surgery. This book gives parents a great deal of medical information, as well as ideas on how to explain the subject to young children. It is not a book for the children themselves, although it has wonderful illustrations to share with the child – it even offers some direct quotes to use to begin conversations about different parts of the procedure. My favorite resource is the list of suggested items to have on hand at home after the surgery to make recovery easier on everyone. There is also a list of children’s books about the subject. I have read a previous book by this same author (Please Explain ‘Terrorism’ to Me) and enjoy how these books provide easy-to-use ways to explain difficult topics to kids. The books look like they are children’s picture books, and while there are some pictures, the books are definitely geared towards parents and helping parents find ways to explain topics – such as going through a Tonsillectomy and an Adenoidectomy. As a parent who hasn’t gone through it myself, I wouldn’t have the slightest idea how to start if my children needed to go through it. 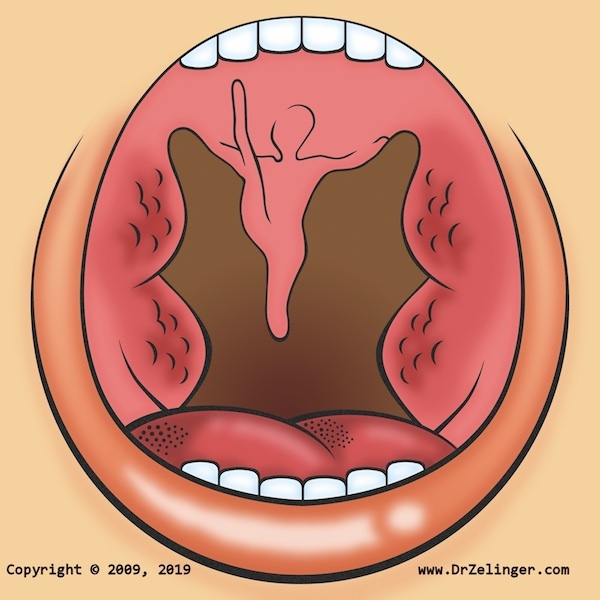 Fortunately for me, Please Explain Tonsillectomy and Adenoidectomy to Me provides easy to understand terminology and vocabulary so that not only can I understand it, but also I can better explain it to my children (or a child). The author does an amazing job sharing knowledge so caregivers may process and share the information with children. I have found these Please Explain books to be a great help in assisting with those tricky topics about which children tend to inquire! First, let me say despite the cover this is *not* a picture book, so if that is what you’re looking for, you’ll be disappointed. I was very impressed by the book itself. It’s perfect for caregivers of children about to undergo a tonsillectomy or adenoidectomy. Not only are the basics of the procedure covered, but there is also a timeline of when to talk to your child about the procedure. The wording is easier for a child to understand and the back of the book includes a checklist and fact sheet of important info. This book is perfect not just for talking to your child but also for preparing yourself. Having never had my tonsils or adenoids removed – just the thought of it is frightening to me even as an adult – I can just imagine how terrified a young child would be. This book definitely gives great suggestions, in my opinion, about how to help alleviate at least some of those fears – and not only for the child, but for the parents and siblings as well. It gives a step-by-step plan on how to broach the subject gently. Of course, not everyone will have the time to slowly go through all the suggestions…but as many as you can do, do!! The illustrations are easy to view and won’t scare a child. The suggestion to play “Operation” and to read books on the subject to ease the child into acceptance makes sense. If you or someone you know has a child that will need their tonsils and/or adenoids removed, I suggest that you read this! I really enjoyed Zelinger’s previous Please Explain books and found this one to be on par with the others. It was jam packed with information for parents, and from start to finish, the book walks you through the procedure with ease. The author breaks down the process of explaining to your child into four phases: introducing the topic to your child (1 -2 months before surgery), tackling the subject (3/4 weeks before surgery), getting ready (2/3 weeks before surgery) and the day of the surgery. There is also a preparation list and possible complications that can arise from the surgery towards the end. This is a much more parental book as opposed to the other, with lots of medical terminology, but there are child friendly explanations throughout to help guide you. I would suggest you read through it first and then tackle the subject with your child. I found it really interesting how the authors make the child a part of the conversation and remind parents not to have the initial conversation in front of their child. So many parents give into those fears and discuss it on the car ride home, scaring a child A gentle reminder to have the conversation behind closed doors and to show the child a united front are key to reassuring a child. From start to finish, this book walks families through the procedure and I cannot wait to read more from these authors. Reading books can be a great way to help prepare you and your child for the surgical experience. Below is a list of books by age group that we find helpful for many families. Throughout the advice found in the pages of this book, I saw respect for the child as a person. 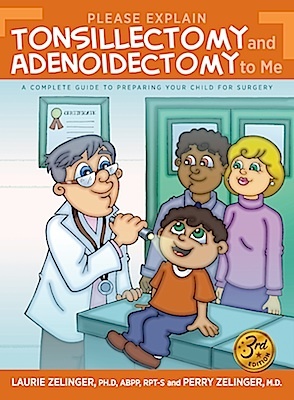 Although this book is not meant to be read to a child (I initially thought it was when I requested it for review because it was categorized under books for children of Pre-K age), the parent can still show the illustrations and summarize the explanations especially prepared for telling their children why they need to have their tonsils or adenoids removed. As a mom you never want your child to be sick or to feel bad, or even to have to go through a surgery. Then one day you realize that they are suffering more days being sick than they need to and the cost of missing work is getting to be almost as much as the medical bills. My son has finally surpassed the amount of “needed” bouts with strep and has been set up for a tonsillectomy. I was a little nervous about what to expect and how to explain it to him. Thankfully I was blessed with the opportunity to review the book , The O, My in TonsillectOMY & AdenoidectOMY for Surgery by Laurie Zelinger. I jumped at the chance to get my briefing on the ups and downs of the surgery pre- and post-operatively. She keeps it very basic with steps on how to explain it to the child without causing immediate panic. I wasn’t worried about my son panicking, I was worried about me! I got ideas on how to approach the subject with him, pep talks for use prior to the surgery, all the way up to days before and the day of surgery. She gave me the “right” words to say so as to help my son understand what will be happening on his level. There is even a wonderful checklist in the back of the book to help with remembering what to bring to the surgery. Her “ultimate preparation list” looks like it has everything covered! Her post-operative care was detailed and very helpful. I am thankful to have something I can refer to just in case I might forget what to do. Things like propping extra pillows under him while he sleeps, keeping him on his side to help with breathing. There [are] also signs she lists to watch for just in case you’re not sure, things like fevers, dehydration, and infection. I love this book and definitely recommend it to any moms who may be on the path of their child having this surgery. The book was easy to read, laid out wonderfully, and everything was explained in simple terms for you to understand. Thumbs up to Dr. Zelinger and her wonderful book. I received a copy of this book to review. All comments are reflections based solely on my opinions. 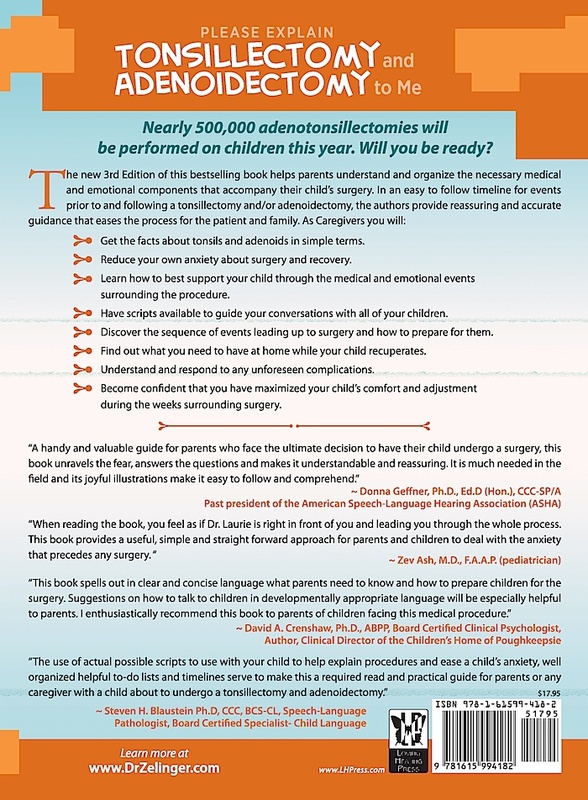 The ‘O, MY’ in TonsillectOMY and AdenoidectOMY by Laurie Zelinger, Ph.D., is a book designed to educate parents about the procedures, what to expect on the day of surgery, and what happens in the days after. The book is divided into four phases: “Introducing the Topic to Your Child”, “Tackling the Subject”, “Getting Closer, Getting Ready”, and “The Day of Surgery- It’s Here!” Following the four phases is a preparation list and a special section about rare, but possible complications. Dr. Zelinger has written a clear, specific guide to aide parents in describing the what, when, why, and how of having a tonsillectomy and adenoidectomy. There is a countdown of what to tell your child beginning at a 1-2 months period prior to surgery to the day of surgery. Specific dialogues are suggested to give parents a practice sheet of sorts to initiate conversation about what the child should expect. As a parent of two children that have had their tonsils and adenoids removed, I can attest to the missing information I had before surgery and how nervous the lack of knowledge made me. I remember having a very thin pamphlet to read. Dr. Zelinger’s book would have not only alleviated any anxiousness my children may have had, but it would have given me confidence and peace of mind about what to expect the day of surgery and immediately following. One child had no complications while the other threw up, suffered worse pain, and had nightmares. This book lays out the possible side effects my child experienced which would have put me more at ease. “The ‘O, MY’ in TonsillectOMY and AdenoidectOMY” is a must read for parents of future tonsillectomy and adenoidectomy patients and ENT’s who perform the surgeries. Moomettes Magnificents: This is an informative reference source for parents, grandparents or daycare providers to sooth a child’s fears before undergoing surgery for a Tonsillectomy or Adenoidectomy.